Thought I’d drop an update on the snow. It’s over six inches now, and will continue to fall for maybe another 36 hours. We’ll have probably 20 inches or more when it’s done. I meant to share more about the hok ski concept, specifically their origin and history. 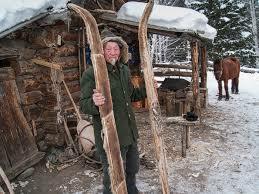 The concept originated in Northern China, where the Altai people (and no doubt other indigenous people) made skis then covered them with animal skins. The skins provided the same climbing/gliding action as the modern fabric skins. The fur would act as a grip when ascending, but would allow gliding when descending hills and trails. Here’s a photo gleaned from the web. 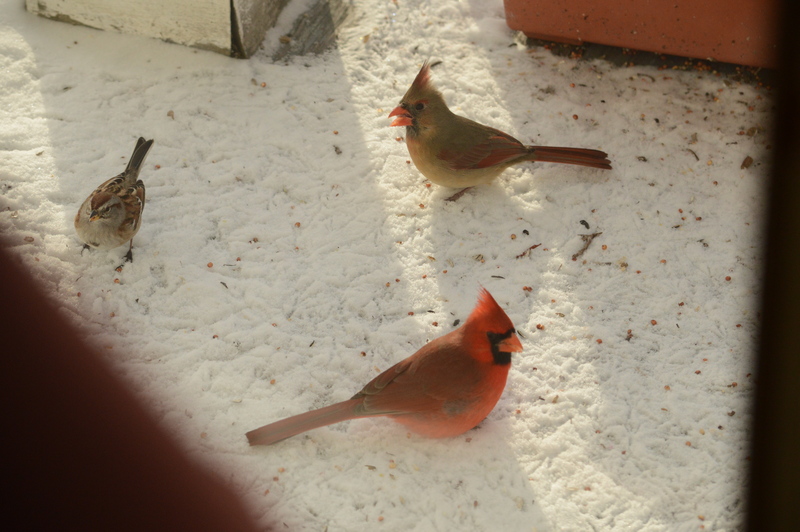 I also forgot to include the photos of the hard-core football fan neighbors on Superbowl Sunday. Tom & Lynn always have a gathering for the game, and, like many Americans, they assemble a football game of their own to play before the big show. It’s quite a big event across the road, and the cars are crowded in their driveway and mine. The dogs (mine and Betsy’s) go nuts at all the traffic, and we get to witness the annual event, ready to call the ambulance when someone slips on the snow and breaks a wrist. Okay, so the worrisome patriarch takes over a bit. Of course snow, football, big guys and beer are a good combination for some potential injuries. Fortunately, there were no incidents (besides heated debates about where the line of scrimmage should be). And I thought I was a winter die-hard! The American Robins are returning to their northwoods homes. They gather to roost in the pine stands by the hundreds, perhaps thousands at times. It’s quite a cacophony, and a sure sign that spring is right around the corner, however hard I may resist! Lastly, I meant to mention that our winters, our snow cover, can actually linger long. I may have painted a softened picture of winter’s real potential. Of course, I wouldn’t be an old patriarch if I didn’t say “winter’s aren’t what they used to be.”, but I can back it up. With witnesses! One year I took son Ryan and daughter Kerry up to Cherry Valley to see the crevasses. These are large fissures in the top of the sedimentary ridge the Niagara River laid down, when it used to pass right through here a few hundred million years ago. A great upheaval caused a change to what would one day be New York State. That tectonic shift formed the Niagara Escarpment, and from thence forth the the great river turned northward, to its present-day track. Now “The Mighty Mohawk”, though dwarfed by the Great Niagara, follows the same 2-billion-year-old valley the Great One once did. Good thing, too, as Engleville was under a few hundred feet of water hitherto! So, we had a “good” winter that year. Plenty of snow and late in the year, maybe a blizzard in March like the one I’m looking at right now outside my window. It was the first week of June when we went to Cherry Valley, and climbed around in the crevices that were perhaps ten feet deep on average. There, ten feet below the forest floor, in a north corner of this solid rock sanctuary, was a little remnant pile of the winter’s snow. We marveled at it. We handled it. We picked it up. And that was the year we will always remember. The year we made snowballs in June! Mind you, Ryan is now 36, and “the baby”, Kerry, is now 33. A special bonus, a 25-year-old photo of Kerry throwing snow at me. A “good” old-fashioned winter! Well, have to run. That snowmobile isn’t going to ride itself! This entry was posted in Sticks Life and tagged Altai People, Family, Hok skis, kids, Mohawk River, Niagara Escarpment, Niagara River, Seasons, Snow, Sporting, Superbowl Sunday on March 2, 2018 by Pazlo.